Can dogs eat Tomatoes and which parts are dangerous to them? Tomatoes are one of the most widely-known superfoods of our diets. This fresh fruit contains high amounts of lycopene, vitamins, and antioxidants that boost benefit after benefit in almost every form they’re consumed. But, can our dogs benefit in the same way? Many people have some concerns about certain tomatoes – they are considered a ‘nightshade’ vegetable, and that comes with a few questions about how poisonous they can be. In short, yes, your dog can absolutely enjoy tomatoes, and a lot of the benefits they provide, as long as you serve them correctly. Serving suggestions – Fresh tomatoes are best for dogs! Tomatoes are so versatile, we tend to use them in everything from tomato paste, to soups, sauces, juice, etc. And while that doesn’t necessarily take away the health benefits of the tomato themselves, the additional ingredients don’t do much for our dogs. However, offering your dog a few pieces of whole, ripe tomato, can give them the same good benefits we experience as humans. Tomatoes are natural cancer fighters, and offer a lot of additional vitamins that your dog could potentially be lacking. Which are safe for dogs? make sure it is 100% ripe. Anything else can be harmful, and won’t offer any healthy benefits whatsoever. 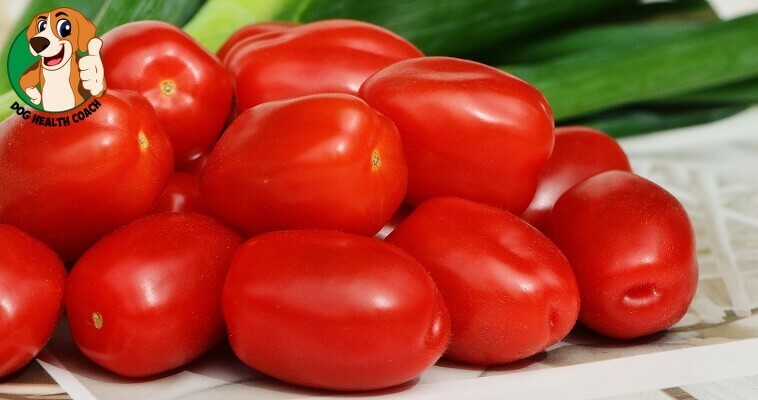 Again, fresh is always best, and offering your dog a few pieces of tomato will not only be refreshing and delicious for them, but can offer many nutritional benefits. Interested in more healthy foods your dog can enjoy? Did we miss anything? What’s you dog’s favorite snack?